Treasured photographs of your special occasion can be restored and preserved, reviving your old faded memories and keeping them safe forever. They also make fantastic gifts. Your newly-restored photographs can transformed into multimedia presentations, complete with your own special menu setup and themes. Even your old VHS video cassettes can be converted to DVD! If your photos (or negatives and slides) are getting mouldy, cracked or brittle, it's important to act quickly to avoid further deterioration or damage. The sooner your photos are scanned into digital format, the better. 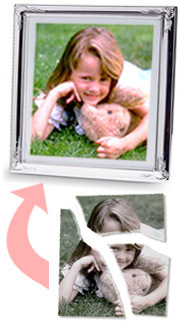 Restoration work is done using a digital copy of your photo, so the original photograph will keep safe and untouched. The restored digital photo is then printed on high quality photo paper. For a little extra, you can add/remove people and objects or even colorise black and white photos or create sepias. 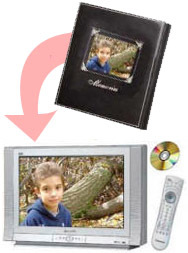 You can even create a slide show of your photos on DVD with music, see the Photo to DVD Slideshow section for details. A unique way to celebrate and commemorate special occasions in your life, or provide entertainment at live events. Make a timeless keepsake and one-of-a-kind gift using photographs, children's drawings, diplomas, or awards. Blending photos and music with elegant dissolves, motion and zooms delivers impact and emotion. An example for a Wedding slideshow could see photos separated into groups (Bride photos from birth, Groom photos from birth, then Bride and Groom together) with different music for each. These sections are introduced with their own title which fits the theme of the event. Temperature, dust and time all help to deteriorate video tapes. Even if they're as little as 10 years old, they could be in danger from wear, disintegration, and magnetic fields. Chemical processes are destroying the tape every day, even when sitting on the shelf! 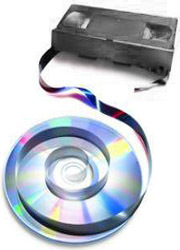 In contrast to video tape, most DVD discs last over 100 years if properly cared for, and the quality will always be as good as the first time you watched it. This is why transferring video to DVD is the smart way to preserve your memories. If you'd like to have a look through the design portfolio of Photos and Images produced by Joker Designs, please browse the Photos and Images portfolio and see what can be achieved. The page showcases just some of the photo-editing options available to you. If you can imagine it, you can be supplied with it!